Velvet Paw Creations: Alice in Wonderland Swap! I'm currently playing in a fun Alice In Wonderland swap called "All Things Alice" hosted by Marion B with some of my fellow Lost Coast Designs DT! We'll be sharing our ATCs over at Lost Coast Portal to Creativity very soon but here's mine in the meanwhile! 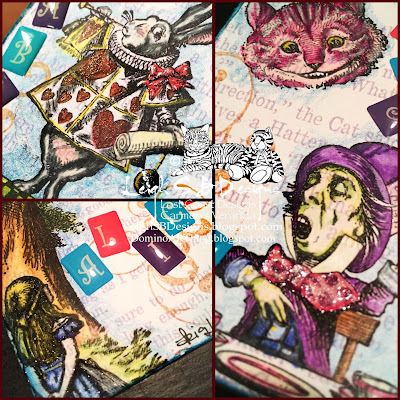 You can see all the swap ATCs shared so far on the All Things Alice Pinterest board. All the stamps I've used are by Lost Coast Designs, we have a large Alice in Wonderland collection for you to choose from so pop on over to LCD and check them out! From the "Alice, Cat and Hatter" set I used the Alice and Cheshire Cat sitting in a tree and from the "Rabbits, Cat Face, Hatter, Rabbit with Watch" set I used the Royal Rabbit, Cheshire Cat Face and the Mad Hatter. I also used Lost Coast's Long Swirl Flourish and the Chessboard. I started out by scanning pages from my original Alice in Wonderland book and adjusted the colour and sized the text to fit the standard ATC size of 2.5" x 3.5" in Photoshop CS6. I printed out the ATCs onto white Neenah cardstock, stamped all the images with Onyx Black Versafine ink and coloured them with Prismacolor coloured pencils. I also used a metallic gold gel pen to add some bling. The flourish was stamped with Tea Dye Distress Ink and I distressed the edges of all 3 ATCs Tim's Paper Distresser tool and applied Peacock Feathers Distress Ink. I punched 2 corners on each ATC with a decorative Fleur-de-lis corner punch and adhered them to black cardstock also cut to the ATC size and added some gold to the black cardstock revealed in the punched corners. I added some shimmer and sparkle to each ATC with touches of clear Wink of Stella and dimension with a White Magic Transparent Viva Pearl pen. Each ATC was then completed with 3D alphabet stickers. so beautiful, Leigh - can´t wait to see them in real life! These are wonderful! It's such a good idea to have an Alice swap, glad I am joining in!